Barbecue sauce (also abbreviated BBQ sauce) is a flavoring sauce used as a marinade, basting (cooking) or topping for meat cooked in the barbecue cooking style, including pork or beef ribs and chicken. It is a ubiquitous condiment and is used on many other foods as well. The ingredients vary widely even within individual countries, but most include some variation on vinegar and/or tomato paste as a base, as well as liquid smoke, spices such as mustard and black pepper, and sweeteners such as sugar or molasses. 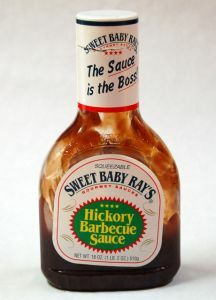 The most common barbecue sauce in the United States is a commercialized Kansas City-style which uses tomato purée, corn syrup, molasses and vinegar and has a long shelf life. This style is less intense but similar to steak sauce, which is itself a direct relative of the ubiquitous British brown sauce. Other regional recipes elsewhere forgo the tomato sauce base in favor of a more penetrating vinegar-dominant marinade. 1. On Hamburgers and Hot Dogs : We love using BBQ sauce as a condiment just like ketchup! It's fantastic with meats on or off the grill, and even adds some variety to grilled vegetables. 2. As a Dipping Sauce : Try dipping baked sweet potato fries in barbecue sauce and we promise you won't be disappointed. 3. Instead of Tomato Sauce on Pizza : We started doing this one week when we realized we were out of tomato sauce and figured using BBQ sauce instead was worth a try. Turns out, it's great! We actually like a mix of BBQ sauce and tomato sauce the best. 4. In Mac n' Cheese : A spoonful of barbecue sauce adds just the barest hint of smoky sweetness to a bowl of mac n' cheese - or any other pasta dish, for that matter! 5. With Beans : To spiff up a quick meal like beans on toast or beans with rice, we like to add a little BBQ sauce to the simmering beans. It adds flavor and turns a very basic meal into a great one. can u send me recipe..